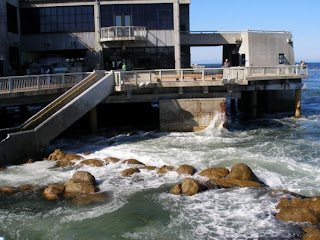 The Monterey Bay Aquarium is a great place to spend a day while in Monterey. The have wonderful permanent exhibits and a number of great special exhibits. There is a variety of interactive displays, especially for kids. 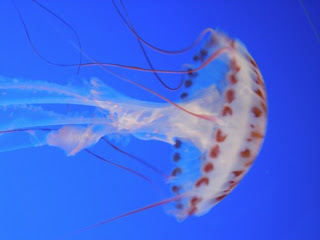 One of my favorite exhibits, "Jellies: Living Art" will be closing soon, but the aquarium still has plenty of jellies on display in the Jelly Gallery on the second floor. 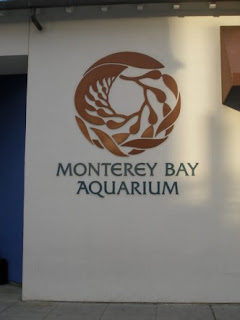 However, my favorite exhibit of all and one of the best things about Monterey: sea otters! 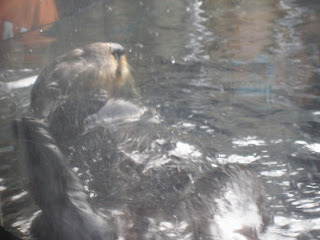 The aquarium has several sea otter residents that you can watch during their thrice daily feeding and training programs. You might want to get to the exhibit early as this is always very crowded. The other great thing about sea otters in Monterey is that you don't have to go to the aquarium to see them...they are visible throughout the day frolicking in the kelp beds. The sea otters are especially active in the early morning and the early evening, but can be seen at other times of the day as well, often floating asleep on their backs. 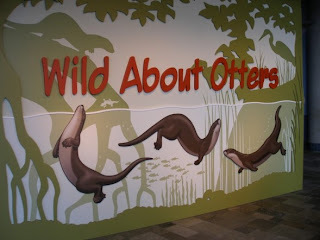 Currently the aquarium has the "Wild About Otters" exhibit that displays other otters from around the world and provides information about the various habitats and other animals that live in those regions. Definitely check this exhibit out.